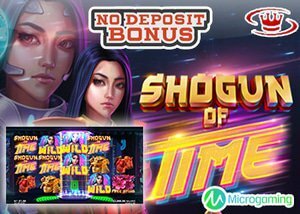 Experience how Japan's cyberpunk future and feudal past collide in the new Shogun of Time slot with an exclusive Microgaming no deposit bonus. The new Shogun of Time slot was exclusively developed for Microgaming by independent studio and partner, Just For The Win. Combining elements of futuristic high-tech cyberpunk and ancient Japan, the story is based on a female Samurai warlord along with her alter ego, known as cybergirl. The theme and atmosphere portrayed in the game take place in a futuristic adaption of Tokyo equipped with incredible sound effects, mind-blowing animation quality, and realistic graphics to provide a truly outstanding reel spinning adventure from the future. The new Shogun of Time slot initially features 3 reels with 4 rows along with an impressive 81 pay lines when you open the game. However, you will also be able to enjoy a 5 reel setup with 243 Ways to Win thanks to the embedded bonus features in the game. This cyber-punk inspired slot comes with a re-spin feature, an additional 5th reel, and a free spin feature along with a top paying jackpot bonus worth 1,000 coins up for grabs in the base game. The incredible time-travelling cyberpunk female will take the role of the wild symbol on the reels and will substitute for all symbols apart from the scatter symbol. It will also reward the highest payout in the game when 4 are displayed across the reel set. Once you manage to land a 4 of a kind winning combination, you will trigger the Reel Split Re-Spin feature. When this feature is activated, a 5th reel will be added to the center of the reel set while the initial 4 reels will lock into place. Only the 5th reel will spin during the re-spin feature to potentially provide a much better payout. The main attraction in the new Shogun of Time slot is undoubtedly the free spin feature which you can unlock by landing at least 3 scatter symbols. If you display 3 scatter symbols with your Microgaming casino no deposit bonus, you will receive 8 free spins, while 4 scatter symbols will fetch you 16 free spins. The free spin feature will take place on a 5 reel structure with 243 Ways To Win. Players will also be pleased to know that the center reel will transform into a wild reel for the duration of the free spin feature. The new Shogun of Time slot might not provide the flexibility to adjust the pay lines, but it does come with a total of 10 coin sizes to alter your total bet size per spin. Players can look forward to a minimum bet of $0.10 along with a maximum bet of $100, appealing to both high roller and beginner alike. Microgaming's Shogun of Time slot further excites players with an incredible line-up of theme related slots. This includes Samurai helmets, face masks, chest plates, Japanese fans, and gold coins as high valued symbols along with neon-styled 10's, J's, Q's, K's, and A's as the low valued symbols. The new Shogun of Time slot from Just For The Win and Microgaming comes equipped with a hypnotic selection of bonus features along with a jaw-dropping display of visual treats that you can enjoy with your Microgaming no deposit bonus. You can also claim your no deposit bonus at Slot Boss Casino where you'll be treated to $10 absolutely free. Newly register customers will also be welcomed with a fantastic match bonus on their initial deposit.